Titanic has long fascinated me – the ultimate illustration of human frailty, the unsinkable ship that sank on its maiden voyage. For many years, it was almost a swear word in Belfast but now, having discovered human and not mechanical failings were to blame for history’s most famous maritime disaster, it is a source of pride for the city once more. 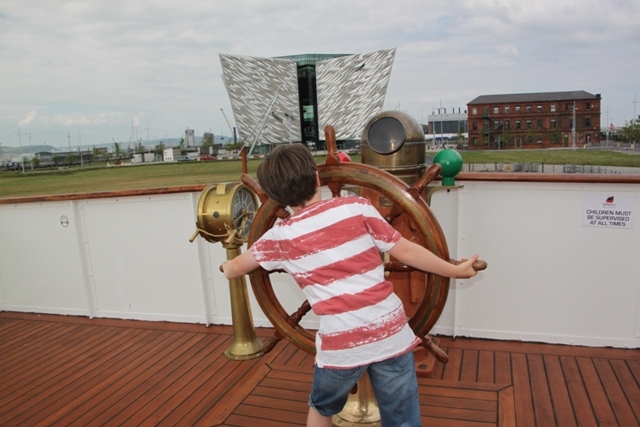 Having been to the new Titanic Visitor Centre already, when we read SS Nomadic, tender to the famous ship was the Titanic Quarter’s latest attraction, a return trip was immediately planned. 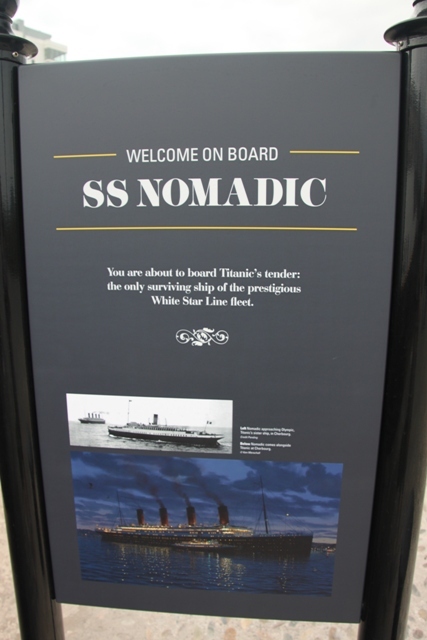 SS Nomadic is arguably the last true link to the Titanic and the White Star Line. 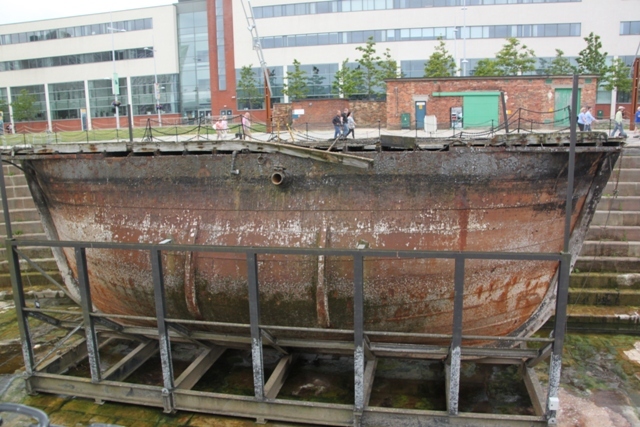 Built in 1911, this was the passenger tender to Titanic – she brought the first and second class passengers to the great ship. 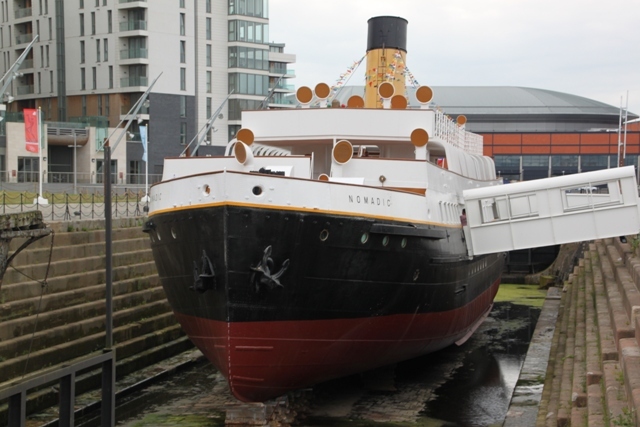 Nomadic was built by the same men, with the same materials on slipway number 1 of the same shipyard as Titanic. This is Titanic’s little sister. 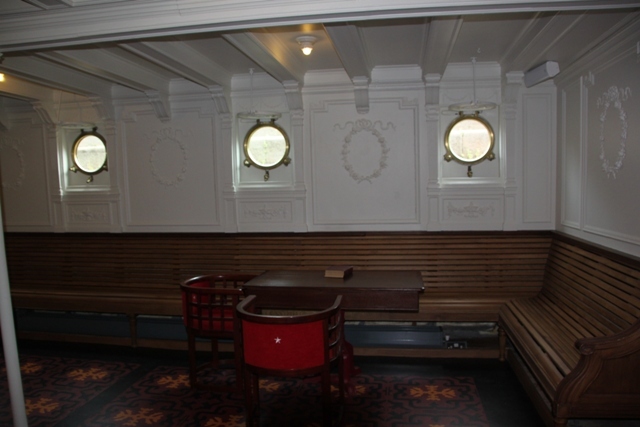 The ship has been restored to its former glory after 7 years and a £7 million restoration program. Thanks to some dedicated N.Irish enthusiasts who started a campaign in 2005 to save her from the scrapheap which seemed to be her destiny, Nomadic has been returned to the city where she was built. 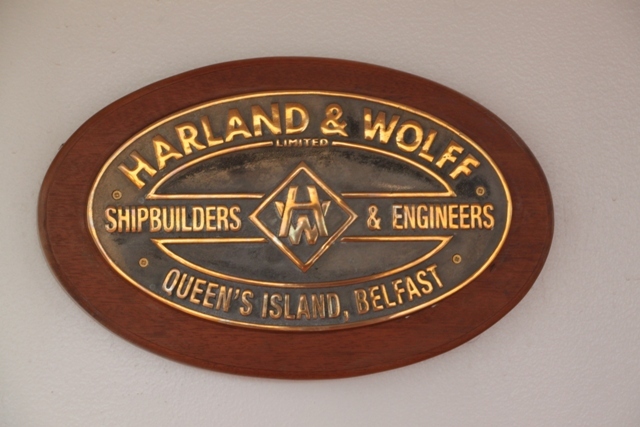 We set out to Hamilton Docks in Belfast, adjacent to the Titanic Exhibition Centre, to visit and explore the ship. The quayside area was a source of fascination for Son – stuff to read, hands-on stuff and a huge, original caisson sparked his imagination. Once on board, we found 4 decks to explore – each one was completely fascinating. The first deck focuses on the link to Titanic. This ship ferried the first and second class passengers to Titanic from the docks of Cherbourg in France. The ship set off from here to sail across the Atlantic. Apparently Titanic was too large to dock in Cherbourg, so the passengers had to be ferried out to the ship. 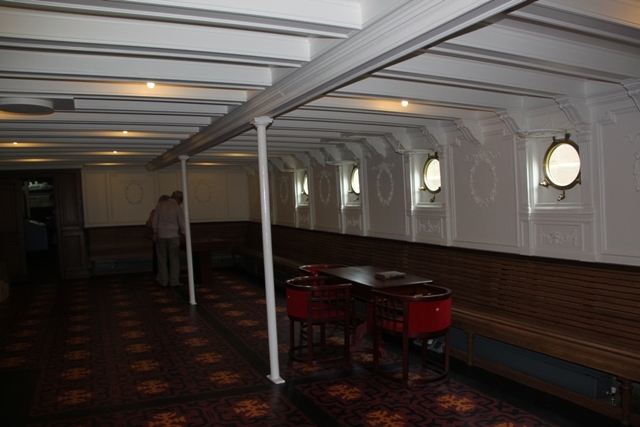 The renovation work is fantastic and apparently the deck looks just as it did when those passengers stepped on board. It is luxurious, full of grandeur and wonderful details giving a great insight into what being a passenger or crew member would have been like. 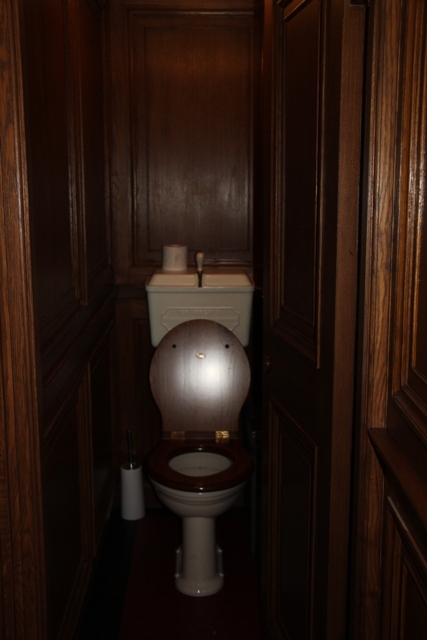 Son, being ever the sophisticate, ignored the ornate ceilings and decorative features and paid more attention to the toilets (they are the originals though), so maybe it’s not all bad. Pierre, the “virtual” barman was also a source of fascination. His image was projected onto the wall when you rang the bell at the bar. (Unfortunately he only serves virtual drinks). You have to make do with tales from Nomadic and gossip about the passengers, a craving for a G&T remains a craving. 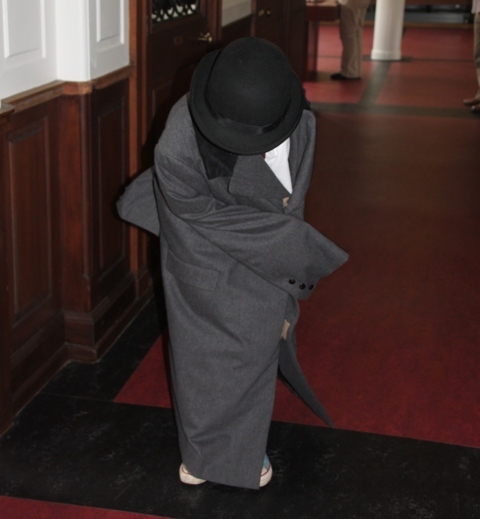 There were displays about emigration, trans-Atlantic travel, passenger stories and a big dressing up box (adults and children alike in our family got stuck into this). The deck below is all about Nomadic during the war years. During World War 1 and 2, she saw active service as a troop carrier and mine sweeper in France. 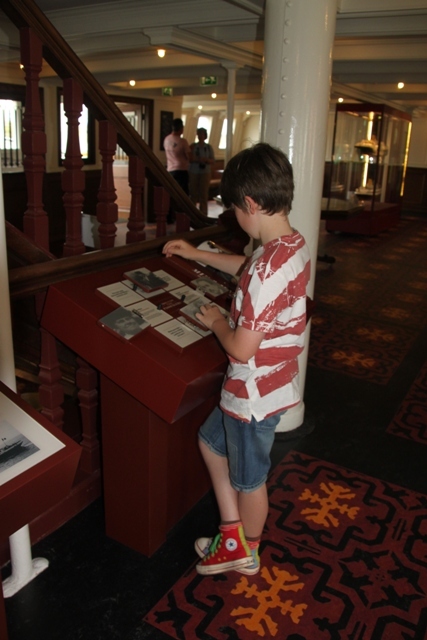 There are more displays, more dressing up boxes, puzzles and a whole new perspective on the ship. Son “steered” Nomadic, played Top Trumps, dressed as a crew member and built his own mini Nomadic model. 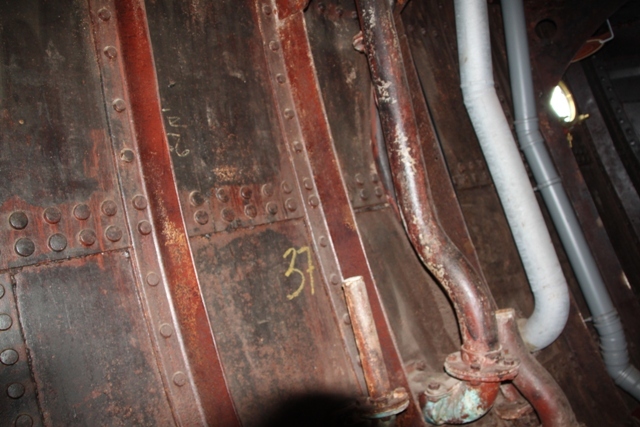 On the lower deck, you can get up close and personal with the original rivets and see how the ship was built and designed. It is much more interesting than it sounds – honestly. 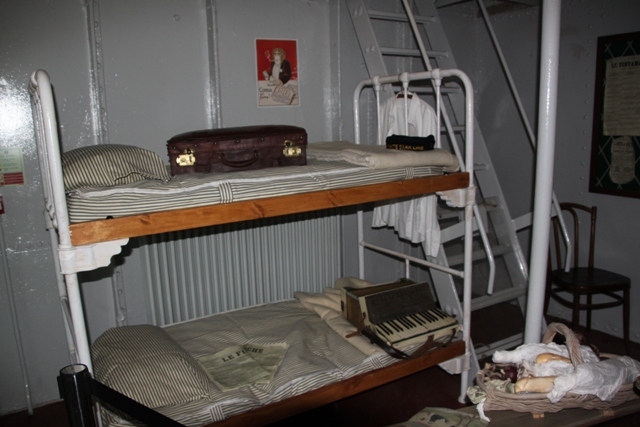 The crew sleeping quarters were a bit of an eye opener – rather them than me. The last deck has photos and information about the restoration, plus another intriguing side to Nomadic. 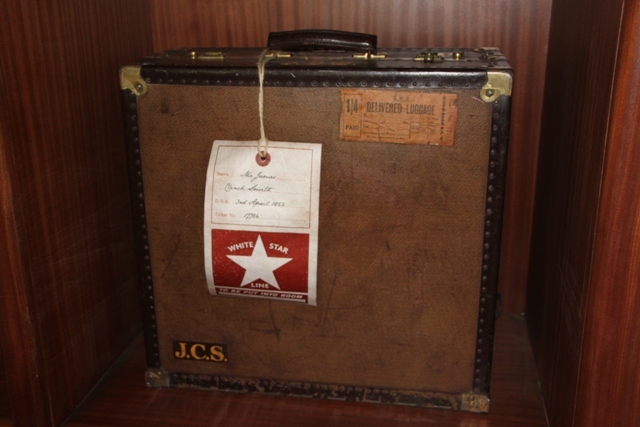 She was part of Cunard and carried numerous celebrities including Elizabeth Taylor and Richard Burton. Then for 30 years, she was a floating restaurant in Paris – quite a life story. We took a stroll along the bridge deck and admired the views of Hamilton Dock and Belfast Harbour. Son took a turn on the ship’s wheel – look out for Titanic ahead. 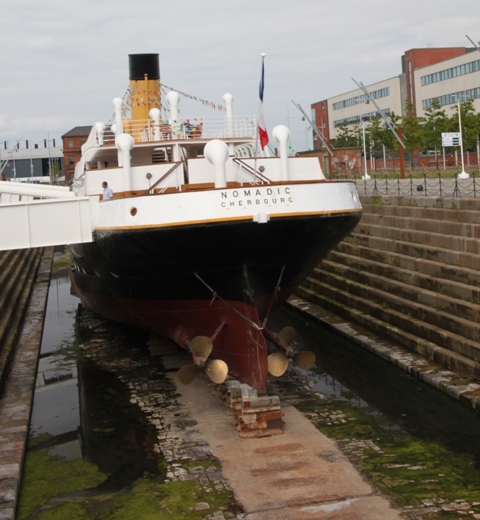 The visitor centre is the same height as the original ship – while Nomadic is exactly one quarter the size of Titanic. 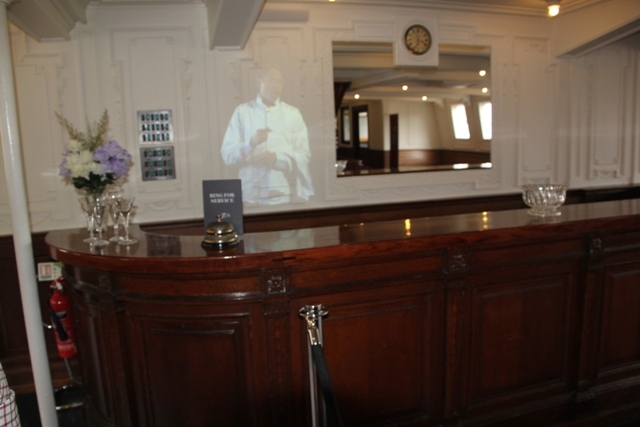 On the way out we found another “virtual” friend – peek into the Captain’s cabin and he will chat with you. Souvenir shops are not normally on my list (I am the polar opposite to my son), but the one here was great, even I was swayed. They had lots of tasteful and interesting bits and pieces – son still preferred the plastic tat though. 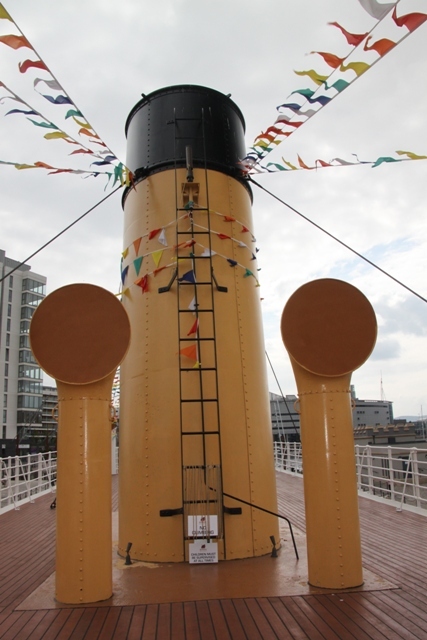 We loved SS Nomadic. I (Titanic nut) may be biased, but I think there is something very special about this little ship. The Titanic Visitor Centre may be grander, bigger and full of more “wow experiences”. Climbing on board Nomadic is though, as close as you get to Titanic (without diving to the ocean’s depths). Apparently the visitor numbers are not what they expected (or needed) and it is not the success they hoped for. This is a shame – maybe her fortunes will improve over the coming months. I hope so – she is a true gem. Just have to find ourselves in Belfast, then! Yes, a long way for you….. but Belfast (and Ireland) are great – I am biased though! I love anything to do with the Titanic so will definitely add this to my list of things to do! It looks great, thank you for the post! It is a great experience, definitely worth doing! that’s pretty cool. I have to check this out when I go to Ireland. Yes it’s so worth visiting if you are into the Titanic story! Just been to the Nomadic yesterday for my first visit (22 February 2014) and enjoyed it. The tour guide was very helpful, friendly and she give us lots of information. Plenty of people were on each tour, I was glad to see. Very moving to think that so much is still there as it was in the days when taking passengers to the Titanic. After the tour you can just wander around the ship at your own pace, taking pictures if you wish. That ” little” ship is surprisingly big! Weather was good but I will go back to see and photograph the Nomadic in a summer day. Glad to hear there were plenty of people – hopefully that means things have picked up since we were there. Glad you enjoyed it too, we also found it fascinating and moving. There were perhaps at least 15 – 20 people on the tour I was on and substantially more than that on the following tour of foreign visitors, so seemed busy enough, although it was a Saturday. The Titanic building had plenty visitors in the shop and restaurants, but I haven’t yet done the Titanic tour. 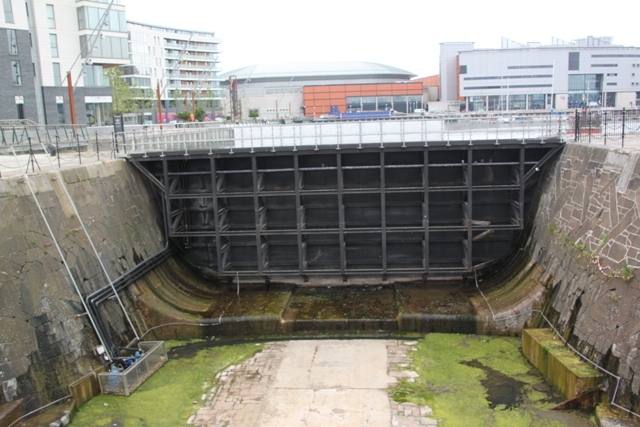 One thing struck me is a pity about the Nomadic, – the ship is sitting down in the bottom of the dry dock and would really look magnificent if she was a lot higher. Thank you for your well worded comments on your experience and I hope you continue to add more about your travels, especially in Northern Ireland. I couldn’t resist putting my thoughts in! Know what you mean about Nomadic being so low down, hadn’t thought about it John but I definitely agree, she should be higher. Thank you for your kind comments and thank you for reading my blog! Hi Joy! I’m enjoying your reports on Northern Ireland. Not a lot of people think to go up ‘north’ when in Ireland. Belfast is my home town, though I’ve lived in the U.S. for well over twenty years. I got a chance in early 2013 to see the ‘new’ Titanic Visitors Center’ and thought it was very well done. I especially liked the outside area with the ship length and width etc. framed out on the concrete and the deaths marked by grass etc.. made it all too real 😦 but very informative. Did not see The Nomadic when I was there, must have missed it, or maybe it wasn’t there yet? I know what you mean Kerry – most people skip out the north, I definitely think they are missing out! We saw Nomadic end of July 2013 and it had opened days before so you must have just missed it!! Shame because it’s really interesting – maybe next time….